Mortgage in Spain: how does it work and what should you know? Do you need a mortgage to finance your property in Spain? Then it is good to know what your options and possibilities are before you start your property search. On this page you will find basic information about a mortgage in Spain. Complex mortgage products don´t exist in Spain. You can usually only take out an annuity mortgage where you pay a monthly amount of interest and repayment. Some Spanish banks also offer interest-only mortgages, where you repay nothing and only pay interest. A combination of the two is also sometimes possible. More and more banks in Spain offer a mortgage with a fixed interest rate for a longer duration. That means you can even pay the same interest for a period of 30 years. Generally you will however pay a variable interest rate which changes monthly or annually. This rate is linked to the ‘Euribor’ interest rate. All European banks use Euribor but in Spain it is also clearly communicated. You may for example see ads saying’ Euribor + 1%’. That means you pay the Euribor rate plus a 1% premium (profit) for the bank. But be aware: the bank with the lowest interest rate may not be the bank with the cheapest mortgage. Banks also charge fees and some Spanish banks require you to purchase additional products, such as a life insurance policy. Therefore, look at the final amount you monthly pay – and not just at the interest rate. Tip: Do you want an indication of your mortgage costs? Then you will find our mortgage calculator and more information about Euribor here. Most Spanish banks finance 60% to 70% of the purchase price or the appraised value of your home (the lower of the two). Additionally you will usually have to finance the purchase costs (such as transfer tax and notary costs) yourself. If you buy a bank repossession directly from a bank and take out a mortgage at the same bank, an exception is often made. You than can then sometimes finance up to 100% of the purchase price using a mortgage. 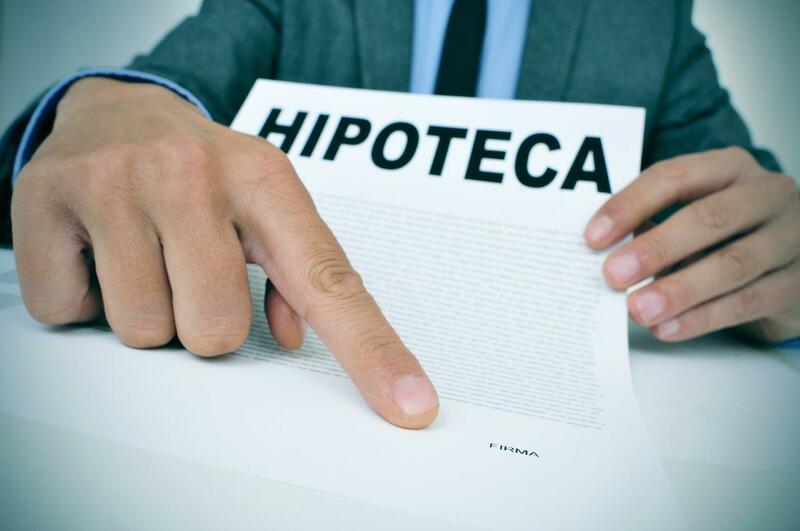 The amortization period of a mortgage in Spain can be up to 40 years, but this depends on your age. The older you are, the shorter the allowed amortization period for a mortgage in Spain. Of course, a mortgage advisor can tell you more about this. What do Spanish banks take into consideration? Your income. On average you will have to earn three times more than the height of your monthly mortgage payments. If you for instance want a mortgage of 1,000 euros per month, your net income should be roughly 3,000 euros per month. You can obviously have income from permanent employment, but for example rental income counts as well. As an entrepreneur you usually have to prove your income with figures of the last two years. Your age. Most Spanish banks want you to have paid off your mortgage at the age of 75. The property valuation. You can usually get a mortgage of up to 60% or 70% of the appraisal value or the purchase price. The bank usually asks an independent appraiser to determine the value of the property. Other criteria. The bank may look at other things as well, such as your mortgage in your home country, your family situation, the type of work you do and whether you are going to live in your Spanish property permanently as a resident. This may all seem more complicated than it actually is. Suppose you buy a property for 350,000 euros which is valued at 380,000 euros. Which amount do you roughly have to finance yourself and for which amount can you get a mortgage in Spain? The mortgage application usually takes about four weeks in Spain. To quickly make an offer on a property you like, it helps if you already know where you stand. Ask a mortgage advisor to make a calculation for you – even if you haven´t started your property search yet. You can then search specifically for a property that suits your financial possibilities and not lose time with a mortgage if you find your Spanish dream home.